Elise D'Haene is a novelist, screenwriter and published author. Among her screen credits, she was a writer on Disney's The Little Mermaid II and penned several episodes of the Showtime series Red Shoe Diaries and Chromium Blue. 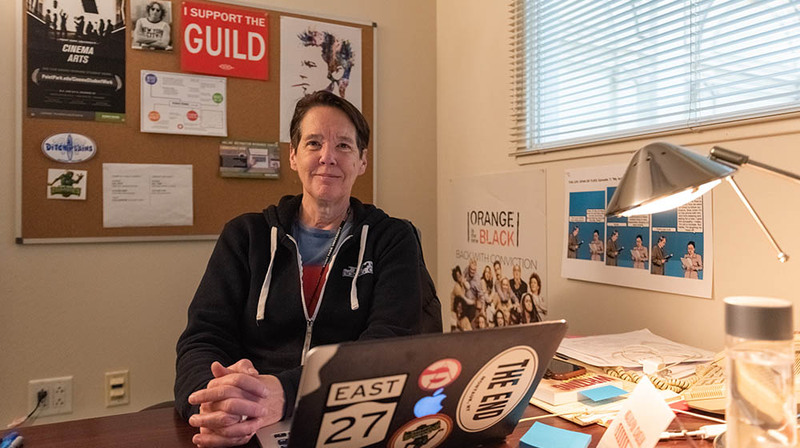 She was a story editor for the NBC series Wind on Water and has written or co-written dozens of pilot scripts for Disney, FOX, FX, NBC and ABC, among others. "I am engaged fully in each student’s project. I LOVE analyzing and developing stories of all genres. I get super excited to work with students on developing their projects from the spark of an idea to its completion as a fully realized project. I’m all in and I expect my students to be all in as well." Tell us about your professional experience and how you incorporate it into the classroom. I teach screenwriting for film and television, so the number one thing I do is make sure I’m also engaged in writing my own creative projects. I really believe strongly that I must stay active in the industry in order to be an effective teacher. It’s hard work. It’s a tough industry. But writers are writers and what we do is write. The most important thing I can do for my students is to help them ignite their creative spirit and passion and then do the hard work. Matt Pelfrey, director of Point Park's low-residency M.F.A. in writing for the screen and stage program, inspires me constantly to write, write, write. What classes do you teach at Point Park University? I teach full time in the M.F.A. program as well as two undergraduate courses: Introduction to Screenwriting (I love this class) and the Writer’s Life, a course designed to expose screenwriting majors to working professionals and to push them to write in genres they are unfamiliar with. In the M.F.A. program, I teach feature-length screenwriting, one-hour and half-hour television writing, and in Elective in Media Writing, the students can develop a comic book, a graphic novel, a podcast, a web series or any creative project outside their thesis project. I also teach a course on the structural elements of screenwriting and playwriting. I am engaged fully in each student’s project. I LOVE analyzing and developing stories of all genres. I get super excited to work with students on developing their projects from the spark of an idea to its completion as a fully realized project. I’m all in and I expect my students to be all in as well. What advice do you have for a student considering Point Park’s cinema arts programs? The cinema arts faculty are exceptional, committed and work tirelessly to provide students with a comprehensive filmmaking experience. We’re excited and thrilled to see students evolve and grow and learn the benefits of collaborative filmmaking. The students have access to a lot of resources and expertise. My biggest piece of advice is to take full advantage of all that is offered and speak up! It’s brave to major in cinema arts or to get an M.F.A. in writing for the screen and stage. Exploring one’s creativity, telling meaningful stories and exploring the world of storytelling through film is a great way to live one’s life. I say: go for it!